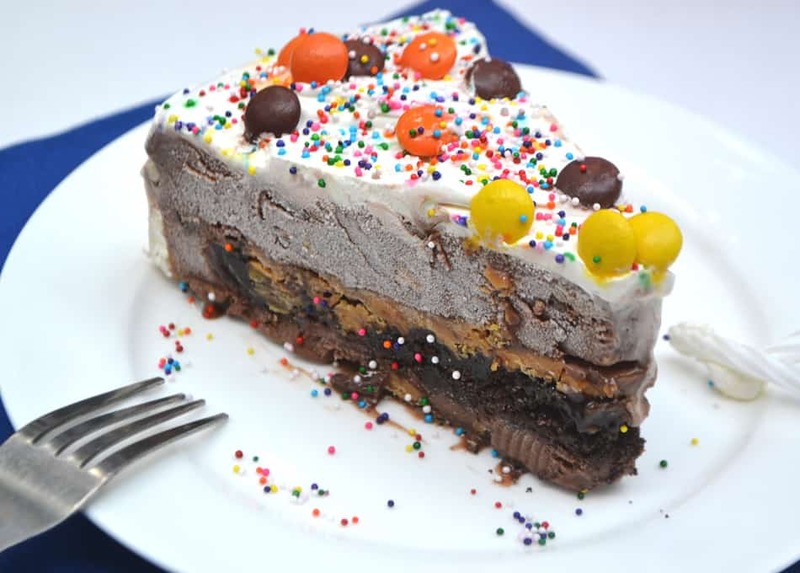 Chocolate Peanut Butter Ice Cream Cake. 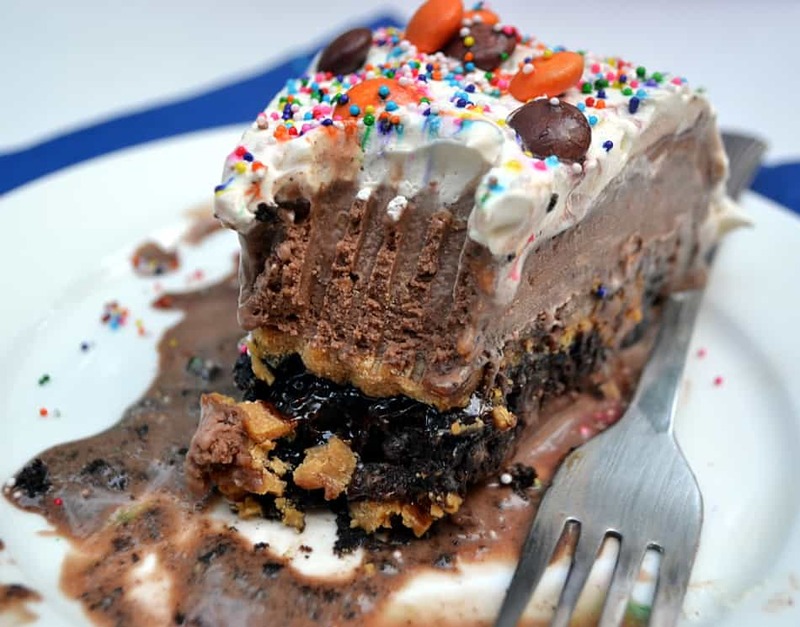 A layer of crushed cookies, chocolate fudge sauce & peanut butter in between two layers of chocolate PB ice cream. Yup, take all that in for a minute. It’s a rich, delicious frozen cake that’s impressive yet surprisingly simple to make. Seriously, you have no idea how many ice cream cakes I’ve made in the past few months. There are a cluster of birthdays in April & May and everyone decided to request an ice cream cake. Bummer – I love baking cakes. I celebrate any excuse to bake a cake! It wasn’t a total loss for me, though. I’m also a May baby so I requested a carrot cake – one of my favorites – one of my family’s least. 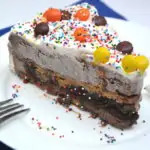 Ice cream cakes really are simple to make. The only factor is time. Make life easy, keep the cake making stress free and allow yourself at least 24 hours to get the cake done. Keeping it easy…anytime I need a large amount of chocolate cookie crumbs I skip the whole cookies. Scraping the cream out is fine for a bit of crumbs, but fussing with it for 2 cups of crumbs is just silly. Find a local grocer that has a bulk section and more than likely you’ll find chocolate cookie crumbs alongside graham cracker crumbs. Total time & effort saver. Every good ice cream cake needs a good frosting. I’ve tried numerous frostings and have been disappointed by every one. A lot of people recommend a frosting made with heavy whipping cream – but it freezes terribly. Ice crystals, yuck. Up to this point, the best frosting I’ve found for an ice cream cake is store bought tub of “Extra Creamy Whipped Topping”. I used a generic store brand, but you can look for “Coolwhip Extra Creamy”. It’s creamy, stays creamy and has just a hint of sweetness. I decorated the cake in a matter of minutes. 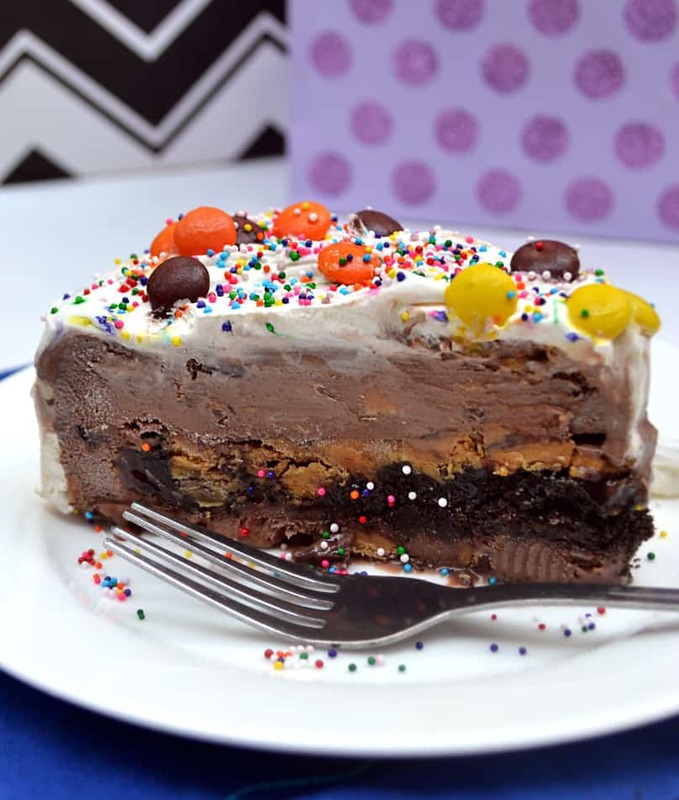 I spread on an even layer of the whipped topping, sprinkled on some Reese’s Pieces candies, sprinkles and threw on a few Mini Peanut Butter Cups. Voila! This cake was a total hit with the chocolate-peanut butter- ice cream cake loving peeps in my home. I truly intended to take a perfect picture of my pretty cake creation before cutting – but – one thing led to another and we had to annihilate that cake. Lol. Amateur move, I know. 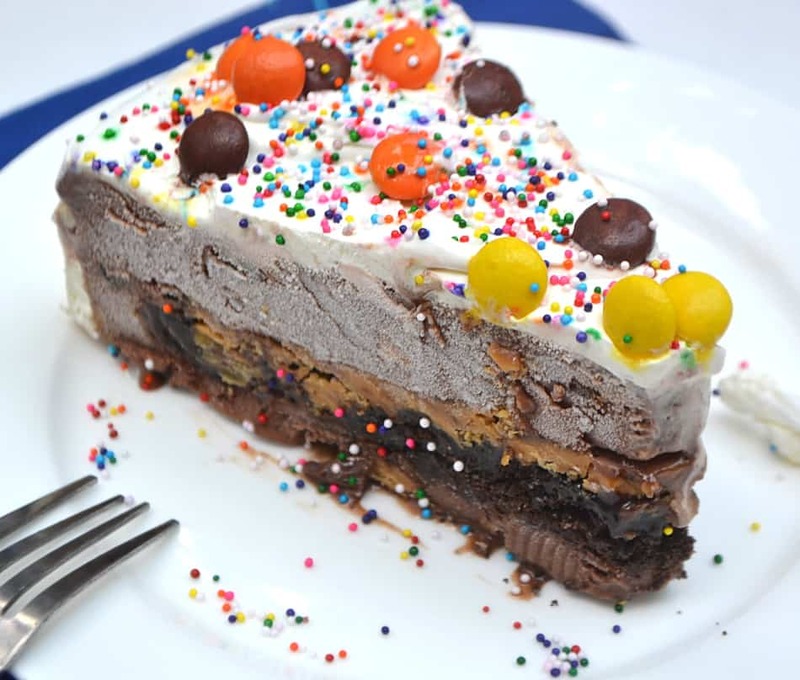 Chocolate Peanut Butter Ice Cream Cake. Start early, plan ahead - this cake needs 8+ hours to set into between layers. Prep your pan. You'll need a 9" springform pan (or whatever size you have will work) and we'll be using just the ring. Toss the ring in the freezer. Note: You could use the whole pan, but think it's simpler to use parchment paper and a flat surface rather than the base. Remove one container of ice cream and let it soften at room temp. We don't want to melt it, we want it softened. After about 20 minutes I plop the ice cream out into a large mixing bowl. If the center is too hard to beat, I cut the ice cream into fourths and let it soften a bit more. Beat ice cream until it is soft and creamy - like the texture of soft serve. Remove springform from freezer. You'll want to place a piece of parchment paper on top of a flat, appropriate sized base. I use a cake carrier base - a cookie sheet, cutting board or large serving plate would work well too. Place your springform on top of parchment paper. Scrape ice cream into springform and place in freezer. Prep your cookie crumbs. Hopefully you won't be doing any prepping here because you bought a bag of chocolate cookie crumbs in your bulk section, but if not, get to scraping that cream out and crush the cookies. Heat the fudge sauce up so it's easily stirred and can be poured. Try 15 seconds, stir, 10 seconds & stir (if necessary). This doesn't need to be molten lava - just barely warm and easily poured. In a microwave safe bowl, combine peanut butter and karo syrup. Microwave for 20 seconds, stir, return to microwave for 15 seconds and stir until thoroughly combined. Remove cake from freezer. Spread an even layer of cookie crumbs over ice cream. Drizzle chocolate fudge sauce evenly over cookie crumbs and drizzle peanut butter sauce over fudge sauce. Using a spatula or fork, gently & evenly spread/swirl fudge and peanut butter over cookie crumbs. Cover cake (another piece of parchment paper works fine) and return to freezer. Let cake set overnight. In the morning, remove your second container of ice cream and let it soften. Repeat process as in step 3 & 4. Scrape ice cream on top of cookie/fudge/pb layer and evenly smooth out. Recover with parchament paper and return cake to freezer. It should sit for a few hours - at least 5-6, preferably 8. The longer, the better. Remove parchment paper for top & bottom of cake. Remove cake from springform. I gently loosen the clamp on side and carefully wiggle & loosen sides of cake with a butter knife. I hear rubbing a hot rag on the outside of the pan helps if you're having problems, but it always releases pretty easily for me. Using a spatula, frost cake with whipped topping - I used the whole container. Decorate with sprinkles, candy, whatever you'd like. Return cake to freezer, covered, until ready to serve. Let cake sit at room temp for 5 -10 minutes before cutting and serving. Cake is easily cut with a knife run under hot water. Enjoy. Store covered in freezer. I’ve never made an ice-cream cake! Crazy, isn’t it? I’ve eaten my fair share, but looking at your recipe and photos, I want to give it a try and make one myself. Plus the chocolate and peanut butter combo can’t be beat! Your birthday is in May? Happy Birthday whatever day yours is! Pinning this one, Amanda! Have a great week! Hi Dawn! I only made my first ice cream cake a few years ago. As a kid EVERYONE loved them – but I always tinkered on the edge of lactose intolerance so I missed out on all that. My husband requested one a few years ago and when I saw the price I went into sticker shock. So I’ve been making them ever since and the requests have gotten more frequent 🙂 Thanks so much for the birthday wishes – this year it fell on Mother’s Day. Lol – my family got off easy this year! This looks to good to eat. I want to make a huge one and eat it all by myself. Thanks Moses! It’s delicious – I could almost eat one all by myself lol. This cake is a kid friendly recipe – you could definitely make one! Wow wow wow! 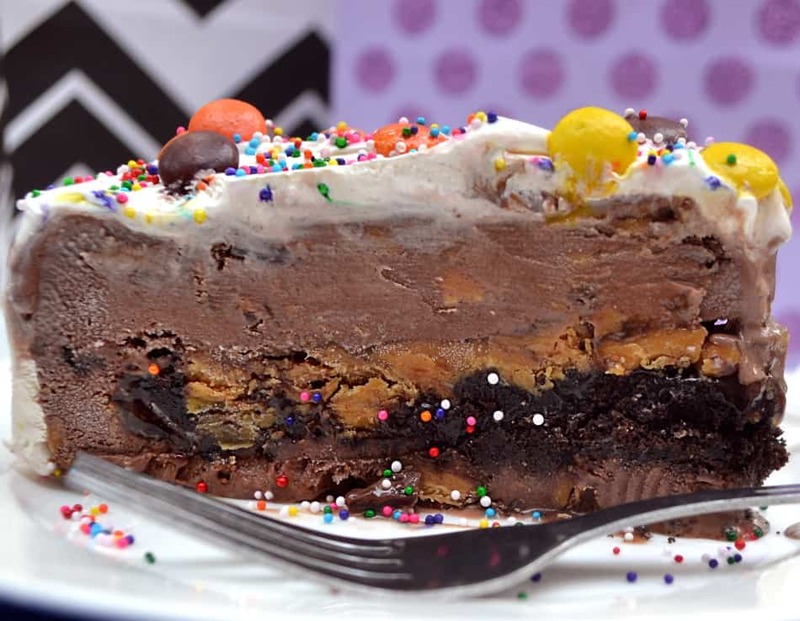 I am so much in love with this chocolate and peanut butter ice-cream cake. Looks too pretty and divine that I so want this in my life. YOU make chocolate look friggin’ AMAZING… And you must know, I am NOT a chocolate fan!